Current Event Director Dave Foltz started laying the blueprint for a senior All-Star Basketball game. The first-ever Roundball Classic is held at North Hagerstown HS. In the girl's game, the South defeats the North, 64-52. Hancock's Jennifer Willison is named MVP for scoring 21 points and pulling 30 rebounds. Hancock's Erin Smith and Smithsburg's Andrew Bohan win the three-point shootouts. Smithsburg's Tyler King wins the slam dunk contest. In the boy's game, the North defeats the South, 90-74. South Hagerstown's Dominique Byrd is named MVP for scoring 27 points and pulling 15 rebounds. The second Roundball Classic is held at Hagerstown CC ARCC. In the girl's game, the North defeats the South. Boonsboro's Jerica Hewitt is named MVP for scoring 14 points. Boonsboro's Alex Baker and Hancock's Dustin Hull win the three-point shootouts. Williamsport's Will Taylor wins the slam dunk contest. Logan Bollinger and Clara Spicer of St. Maria Goretti win the first-ever hot shots contest. In the boy's game, the South defeats the North in overtime. Williamsport's Will Taylor is named MVP. Talks begin with McDonald's about expanding the event to include West Virginia, Pennsylvania, and Frederick, Carroll, and Allegany Counties in Maryland. The 2008 McDonald's Roundball Classic officially expands to include over 36 schools in seven different counties in three states. Roundball Director Dave Foltz expands the 2008 event to include three games, two boys and one girls. Over 90 players and coaches attend the 2008 Roundball Classic media day at Hagerstown CC. The third McDonald's Roundball Classic is held on Good Friday at Hagerstown CC. Well over 1000 people attended to see the North girls pull out a 54-52 victory over the South. Brunswick senior Danielle Maught is named MVP. The South boys net a victory in the Shining Stars game. Jefferson (WV) senior Justin Fagan is named MVP. Greencastle's Dameatric Scott is named MVP for leading the North to a 82-77 victory in the Tri-State Elite Game. The WCAA agrees to hold the 2009 Roundball Classic at Hagerstown CC on Sunday, March 22, 2009. Event Director Dave Foltz decides to turn the 2009 event into one of the top high school all-star basketball events on the East Coast. 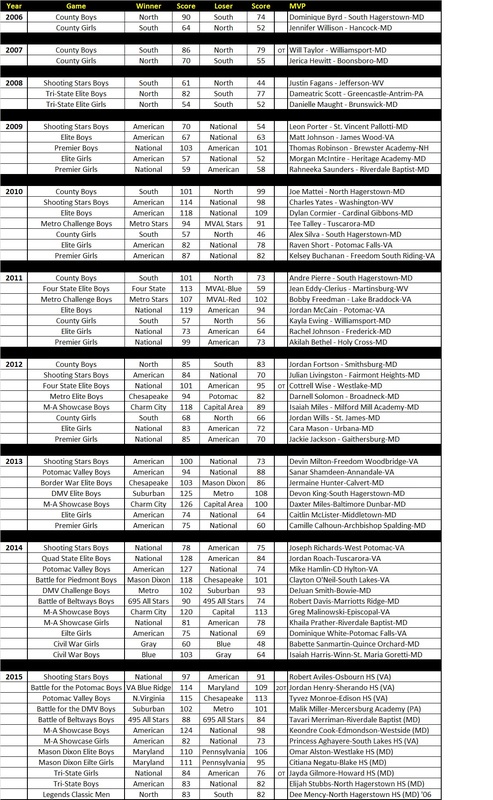 The '09 Roundball will have five all-star games, including a boys and girls game with Division-I bound players. Invitations are mailed to over 200 top 2009 senior boys and girls in four states and DC (MD-WV-PA-VA-DC). The fourth annual McDonald's Roundball Classic is held at Hagerstown Community College. Five games, two three-point shootouts, and a dunk contest is held. 162 players from 96 schools in five states and DC participate. Kansas-bound Thomas Robinson was the event showstopper as he led his Boy's Premier All-Star team to victory while winning game MVP honors. Buffalo Wild Wings agrees to be the exclusive sponsor of the 2010 Roundball Classic. The fifth edition of the Buffalo Wild Wings Roundball Classic is held at Hagerstown CC. All five all-star games are close and high scoring to give the 1000 fans a treat.